TUESDAY, June 3, 2014 (HealthDay News) -- Regular exercise and a diet that includes fish may help colon cancer patients improve their odds of avoiding a relapse, a new study suggests. The likelihood that patients will suffer a return of colon cancer more than doubles if they eat fish less than twice a week, or if they get less than 60 minutes of moderate exercise a week, researchers reported Monday at the American Society of Clinical Oncology meeting in Chicago. Lead author Dr. Mohammed Shaik hopes these preliminary findings will motivate cancer patients to keep healthy habits even though they are sick. "Once somebody is diagnosed with colon cancer, they may think there is nothing they can do to maintain a healthy lifestyle," said Shaik, a fellow at Michigan State University's Breslin Cancer Center. "We show they can help prevent a recurrence." About 135,000 new cases of colorectal cancer occur every year in the United States, according to the American Cancer Society. It's estimated that 50,000 Americans will die of colorectal cancer this year. The multinational study involved 1,515 colon cancer patients from the United States, Poland, Vietnam and Western Europe, including 188 people who suffered a recurrence of their cancer following treatment. Researchers surveyed the patients, asking about their diet, exercise habits, and whether they smoked or consumed alcohol. "We wanted to know what factors could affect their progression," Shaik said. People who eat fish less than twice a week or exercise for less than an hour each week are about 2.5 times more likely to have a recurrence of their colon cancer, the researchers found. No other dietary factors appeared to affect the risk of colon cancer recurrence, including intake of red meat or alcohol consumption. Smoking also did not affect a person's recurrence risk, the study authors noted. The findings regarding fish and exercise are consistent with earlier studies that investigated what might increase someone's risk of developing colon cancer in the first place, Shaik said. However, until the results are published in a peer-reviewed medical journal, they should be considered preliminary. And the association between colon cancer risk, and fish consumption and exercise seen in the study does not prove a cause-and-effect relationship. Researchers have hypothesized that the omega-3 fatty acids in fish might somehow reduce colon cancer risk, Shaik said. It also might be that people who eat more fish end up eating less red meat and processed foods, which other studies have linked to increased colon cancer risk, said Dr. Smitha Krishnamurthi, an ASCO spokeswoman and an associate professor at Case Western Reserve University School of Medicine in Cleveland. 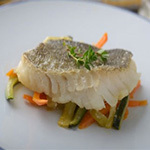 "In the United States, there are people who include fish as part of their diet intentionally to be healthier. It's not a standard part of our diet, like it is in other parts of the world," Krishnamurthi said. Previous studies have established various benefits of exercise for colon cancer, Shaik and Krishnamurthi said. "There's a growing body of epidemiologic evidence that exercise is associated with a reduced risk of recurrent colon cancer," Krishnamurthi said. "It makes sense. For example, we know that exercise reduces insulin levels in the body, and insulin is a growth factor for both normal cells and malignant cells." Exercise also reduces inflammation in the body and helps thwart obesity, which are two other risk factors for colon cancer. Weekly moderate exercise can include activities like a brisk walk or a bicycle ride. You can split up the needed hour of exercise, and do 20 minutes three times a week rather than do it all at once, Shaik said. Krishnamurthi said she is not surprised that smoking or drinking did not seem to affect colon cancer risk. Previous studies have found no link between smoking and colon cancer, and only weak evidence linking colon cancer and alcohol. However, she was surprised that no link was found between red meat consumption and colon cancer recurrence. She said she often warns her patients to avoid red meat and processed foods.